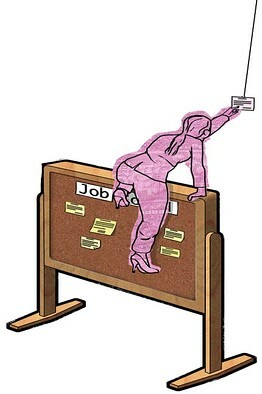 Job boards are irresistible because they seemingly put everything within easy reach. Unfortunately, the majority of job hunters are competing for the same small pool of jobs and getting turned down. More than 80% of job openings are actually unlisted (Hyo’s note – what a stat! ), says Steven Rothberg, founder of job website CollegeRecruiter.com in Minneapolis. This can be a good opportunity for outside candidates with research and networking skills since most companies will try to promote from within or rely on employee referrals. Look for signs: Keep up with what’s going on in your industry. Read trade journals, follow analyst commentary and monitor the stock market for indicators showing which companies are growing, restructuring or contracting out services. Good or bad news can lead to staff changes so regularly check company websites and Facebook pages for jobs since they may not be advertised elsewhere. Compile a list of companies that you’d like to work for and research relevant positions within those organizations. You can find job descriptions on career websites and industry blogs. For newly created jobs, try Glassdoor.com, a site offering inside job information that is supplied by anonymous employees. It’s people, not paper: Tap your personal network of colleagues, friends and family to find those inside connections that can forward your rÃ©sumÃ© to decision makers. If you don’t have a direct line, try reaching outside of your immediate network to friends of friends, old classmates or even cold call somebody in a useful capacity who can offer inside intelligence about company culture. Don’t overlook contacts working for company vendors; they are often seen by decision makers as trusted sources of referrals. The more senior you are, the smaller the network tends to be, so join professional trade organizations and attend trade shows, conferences and seminars. Make it easy to find you: Promote your availability by posting your rÃ©sumÃ© on networking websites like LinkedIn.com and on specific industry websites like ClearanceJobs.com or edjoin.org, a website for educators. Emphasize unique skills on your rÃ©sumÃ© since companies will search online databases when they have specialized needs. That’s how Vanessa Broaten, a teacher from Anaheim Hills, Calif., got her job after posting on several teaching websites. She was hired because of her master’s in education and fluency in Spanish and Portuguese. Follow up with employers since first hiring picks don’t always work out. The same job may get reposted six months down the line. You want to be available to that employer before they post the new job.